Fellow photographer Marco Spalluto (spallutography) and I once discussed the influence of the various factors when taking photographs. Spotting the opportunity, composing the picture, getting all the settings on your camera right and pressing the button at the right time. All of them are essential, but to get everything anywhere close to what you think is perfect takes a lot of time. However, many awesome moments are exactly what the name suggests: moments in time. Capturing a moment in bright daylight is more often than not measured in thousands of a second shutter speed. What if that special moment only lasts a few seconds and the only equipment available is a smartphone? Try anyway! After driving in heavy rain for almost two hours today, I spotted a hole in the clouds that appeared to be big enough to get a glimpse of the sunset. 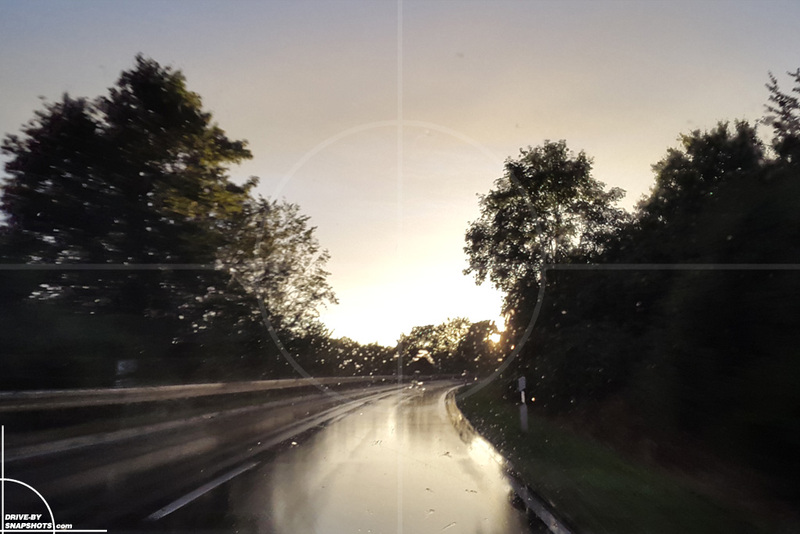 Driving on a westbound road in the rain might just yield the opportunity to see the sunset with some interesting reflections. The first picture admittedly isn’t good. While the composing might be allright and ticking a couple of boxes, the result is rather boring. An explosion of colors! I especially love the contrast between the speed displayed by the proximity to the guardrail and the almost static rain drops on the windshield. The powerline pole is a welcome addition and I am surprised by the detail available in full resolution. 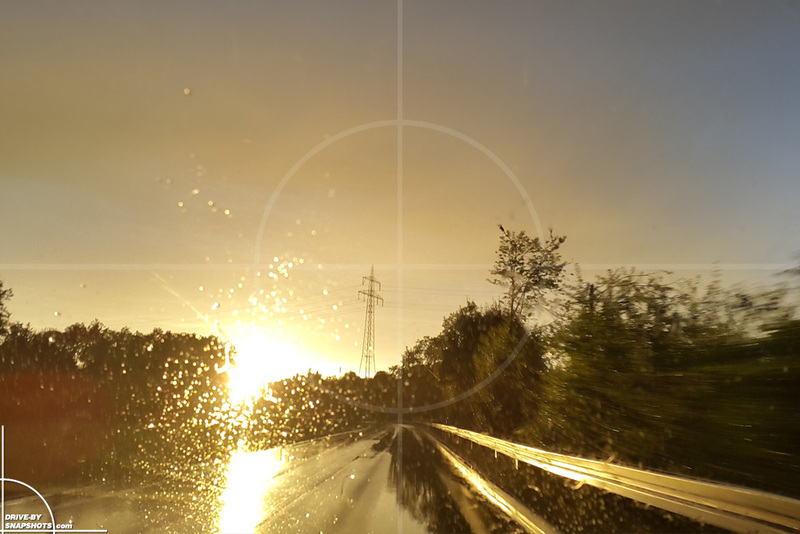 The reflection on the road surface is exactly what I had envisioned. Does that make me a happy photographer? Yes. 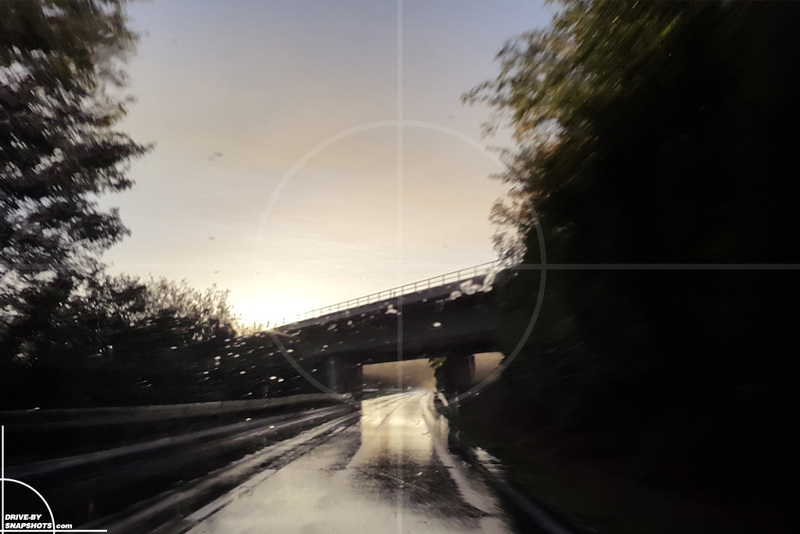 Mind you – the pictures have been taken with the standard camera settings of a Samsung Galaxy Alpha smartphone (while riding shotgun in a friends car).